Trilogy at Encanterra in San Tan Valley, Arizona is a 55+ neighborhood located within the master-planned community of Encanterra Country Club. Encanterra began as an age-targeted community with no age-restriction that targeted active adults and Baby Boomers. In 2011, Shea Homes introduced Trilogy at Encanterra, the 55+ age-restricted enclave within Encanterra. 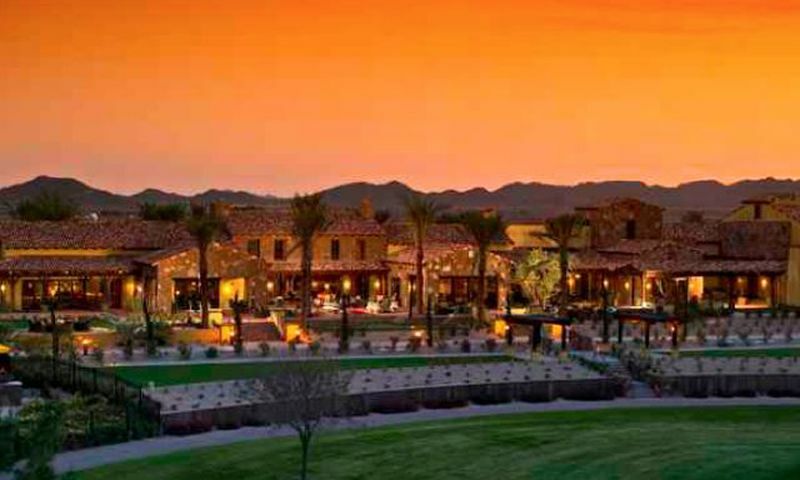 Encanterra is located east of the beautiful San Tan Mountains and just 45 miles southeast of Phoenix. The community appropriately calls itself "city-close but country-quiet." The description is fitting based on the rural location in close proximity to the 202 loop and the Superstition Freeway (60) making a drive into Phoenix and other nearby suburbs like Mesa, Chandler, and Gilbert easily manageable. Also, the new Interstate 24 makes reaching the community and other destinations even easier. The amenities offered by Encanterra appeal to those with an exquisite taste for country club living. The La Casa Club is Encanterra's beautiful clubhouse. This 60,000 square-foot facility boasts some of the finest amenities of any community in the region. Here residents can enjoy the relaxing at the Alvea Spa with its steam rooms and saunas. There is also an indoor pool and state-of-the-art fitness center. Homeowners can meet friends and neighbors at the community's four restaurants and cafe. A wealth of programmed activities are available to residents at the clubhouse's many multi-purpose rooms. Surrounding the clubhouse are lavishly landscaped grounds that include a large patio and huge outdoor resort-style pool. The clubhouse is available to all residents of Encanterra and Trilogy. The Algarve is an 8,000 square foot clubhouse with an art studio, multi-purpose rooms, resort-style outdoor pool, poolside dining at Tapas, eight pickleball courts, and bocce courts. For the golf lovers at Encanterra, there is an 18-hole championship course designed by Tom Lehman. This private course is reserved for residents of Encanterra and Trilogy and their guests as well as non-resident members. It features emerald green fairways and well-manicured greens. It offers one of the finest golf experiences in Phoenix's East Valley. Trilogy at Encanterra offers four exquisite single-family home collections and with over 25 variations of different floor plans, available on a new or resale basis. New construction homebuyers have the option to customize home exteriors in their choice of Italian, French, or Spanish theme. The variety of floor plans and exteriors provides for an upscale appearance unmatched by many of the active adult communities of the East Valley. The Trilogy at Encanterra Collection features resale homes that were designed for active adults. These homes range from 1,437 to 3,403 square feet in size. The Francia Collection offers new and resale homes that range from 1,437 to 1,928 square feet and the Italia Collection features new and resale homes that range from 2,119 to 2,242 square feet. The Espana Collection offers the largest homes within the community that range from 2,164 to 3,403 square feet with second floors. A full-time activities director and concierge cater to the needs of the community's residents and provide a robust array of exciting activities, social events, and management of everyday resident requests. Complete with world-class amenities, residents of Trilogy at Encanterra enjoy attending community events and clubs. Popular clubs include book club, camera club, garden club, golf club, and more. Staying fit is easy because there are numerous exercise classes offered by the fitness center. With neighbors who share the same interests and hobbies, it's easy to make lifelong friendships while living at Trilogy at Encanterra. Trilogy at Encanterra is located in San Tan Valley, Arizona and is part of the larger development of Encanterra. Situated within the Southeast Valley of the Phoenix metropolitan area, residents have easy access to entertainment, dining, and shopping and major roadways that included Loop 202 and US 60. With stunning mountain views throughout the area, there are many recreational opportunities that include hiking, biking, and nature watching. The Phoenix Zoo, Native American Heard Museum, and Desert Botanical Garden are wonderful attractions to visit with grandchildren or friends. With a mild climate, convenient location, and private amenities it's easy to see why Trilogy at Encanterra is a great community for Central Arizona's active adults. The private amenities at Encanterra are open to all residents of the community. Clubhouse - 60,000 Sq. Ft. There are plenty of activities available in Trilogy® at Encanterra. Here is a sample of some of the clubs, activities and classes offered here. The Resort collection offers single-family homes with various floor plans. These homes range from 1,318 square feet to 2,151 square feet offering two to four bedrooms, two or three bathrooms, and an attached two-car garage. Available on a resale only basis, the Trilogy at Encanterra Collection included nine floor plans exclusively designed for the 55+ buyers in Encanterra. These plans are only offered in the age-restricted part of the community. Many of the plans are the same layout as homes in other areas of the community. The Trilogy homes contain fewer included features than in other collections, which translates to a lower base price and makes them more affordable. Upgrades are offered for homebuyers who want to decorate their homes with the latest high-end features and options. The Francia Collection includes eight single-family floor plans. These desirable models feature 1,437 to 1,928 square feet of living space with at least two bedrooms, a den, two bathrooms, and an attached garage. The Italia Collection single-family homes are offered in four floor plans. These single-level homes are desirable for active adults with 2,046 to 2,242 square feet of living space. The elite Espana Collection homes are designed for homebuyers who want the ultimate in space and luxury. Several of the plans include a second floor, which is ideal for families or guests. All six of the Espana Collection homes include a main floor master bedroom making it appealing to active adults who want a spacious single-family home. When first entering the gates of Encanterra, my husband and I were transported into an oasis in the desert. The drive to "La Casa" (which we found out means the clubhouse) is a treat as you wind through a beautifully manicured golf course. Neighbors wave at one another in this enchanting neighborhood where I would love to live. Lunch at the Bistro was delightful as we sat on the outside terrace overlooking the Supersttition Mountains and I believe the18th Hole. A truly spectacular afternoon! We will be back to tour the models next week. We were out to visit the community and were very impressed with the setup and quality of materials used in the clubhouse. It is like living in a resort with all of the features they offer. There are private 'hangout' rooms in each of the men's and women's lockers where you can socialize and enjoy luxury sofas with TVs and pool tables. It's not free certainly but from what we have seen all over the area, this is an incredible place. If you are a golfer you will absolutely love the course. Immaculately maintained and the service everywhere we went was some of the best we have seen. This place deserves a visit. This is one of the nicest communities in The Valley with an unbelievable clubhouse for the homeowners and an incredible golf course. The homes are gorgeous and the location is really great. Lots of close shopping and not too far from two freeways to get you anywhere you need to go. Definitely geared for active adults with the features and available activities provided. This community is NOT restricted to just active adult. Family AND 55+ are combined. My friend just moved in to Trilogy at Encanterra a couple months ago and she just loves it! I've been shopping for a new home in the area also and I hate to feel like a copy-cat but I'll probably be buying a home here too. The amenities are just amazing and there is so much to do. It's been nice having the opportunity to really experience the community through my friend before making a final decision. I'm looking forward to finding my dream home there this summer! 55places.com is not affiliated with the developer(s) or homeowners association of Trilogy® at Encanterra. The information you submit is distributed to a 55places.com Partner Agent, who is a licensed real estate agent. The information regarding Trilogy® at Encanterra has not been verified or approved by the developer or homeowners association. Please verify all information prior to purchasing. 55places.com is not responsible for any errors regarding the information displayed on this website.